Evan Bloodoff reckons the atmosphere inside Fife Ice Arena following Saturday’s overtime win over Glasgow Clan was the best he’s experienced since joining Fife Flyers. Carlo Finucci’s dramatic short-handed winner was met by a deafening roar that carried into the post-match presentations as players danced along to the chanting in the stands. It was a moment that appeared to rekindle the connection between the fans and players and Bloodoff hopes that the positive vibe can carry into the remainder of the campaign and towards the play-offs. “It was really nice to get that win, especially in overtime,” he said. “Nucci’s short-handed goal was pretty exciting, and I think all the fans enjoyed it too. “It was nice to hear everyone so loud. “That was probably the first time I’ve seen it like that in the two years I’ve been here. “It was cool to see them all supporting us, and that they weren’t too mad at us for the little stretch of losses we had there! Bloodoff admitted the team had to dig deep for the result on Saturady after two tough games against a Glasgow side boasting the best run of form in the Elite League. “They were both pretty tough games, and played in a play-off atmosphere,” he said. “Glasgow played really well and they were both just tight games. “We got a couple of bad calls near the end of the game on Saturday, but we were fortunate enough to come out with the win, and that’s all that really matters. “The standings are crazy close now so every game from now on is going to be a big one for us. Bloodoff collected the man of the match following a first period brace on the powerplay as Flyers twice fought back from a goal behind. After being stuck on 16 goals for a number of weeks , the 26-year-old was relieved to get back on the mark. “I was struggling a little bit there in the last five or six games - offensively nothing was going in for me,” he said. “I was getting chances but nothing was really dropping for me. “It’s hard to get anything going when every game you’re not putting the puck in the net or you feel you’re not contributing too much. “I just had to stick to it, keep working and push through it and I was fortunate enough to get two in the last game. Having missed the play-off run through injury last season, Bloodoff is eager to play his part this time around. “My goal at the beginning of this year was to play every game,” he said. “Unfortunaetly I had to miss two or three games with a little knee injury, but I’m feeling good now, and hopefully I can stay healthy for the remainder of the season. 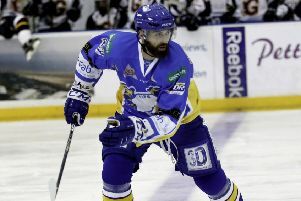 With just one game this weekend, at home to Manchester Storm on Sunday, Bloodoff is expecting a solid team effort. “We’ve nothing to save it for really,” he said. “They’ve always been pretty tough games, but I think we’re going to outskate them on our big ice here.